And now back to our regularly scheduled programming, today is Friday which happens to be my second favorite F word yo. Friday is a great day. The day you can drink guilt free, look forward to sleeping in the next morning, and justify doing nadda all evening. It also happens to be #FanFriday with Sarah, a link up I always read, but never participate in. But all that is gonna change next week friends, because her hilarious post today got the wheels turning in my head, and I’ve got some really inspired topics I’d like to talk about. Talking about sports makes me think of exercise, which makes me think of September Goals, and since its Friday, that means its time for another update. ONE // I haven’t ate out AT ALL this week. Not once. Well until this morning, I had a French Vanilla and breakfast sandwich from Tim Hortons. And I don’t count that, because it was paid for with money from the recycling program at work. And I also don’t count the lunch I had with my bff, cause I paid for it with a gift card, and I hadn’t seen her in a month of Sundays so ya know, it was kind of necessary. TWO // Holy crap, zero shopping this week. None whatsover. No clothes, no shoes, no groceries, I did good. THREE // I was completely 100% unsuccessful with this one this week. Zero exercise completed, or attempted for that matter. Unless of course you course you count lying around watching my newest obsession, Chicago Fire. FOUR // I’m back up to 136. Not happy. But not surprised. Haven’t done much to help myself with this one this week. FIVE // I’ve done quite well with this one again. 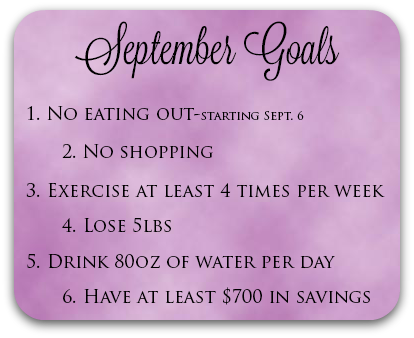 SIX // Happy to say I definitely met this goal! The rules: Link your jams up with Whitney and have a jam sesh with all of us! Also, Chicago Fire is super fabulous!! Super Fabulous is exactly the way to describe it. I could stare at Kelly Severide all day. Matthew Casey isn't bad on the eyes either.